What’s all this about then? It was one thing for Big Sam Allardyce to insist on playing a striker in midfield, but now he appears to have taken to playing a porcupine in midfield. 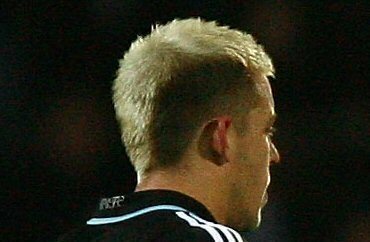 Alan Smith has rekindled his love affair with peroxide. Unfortunately there wasn’t enough left in his last bottle to do a full head of hair. You guys need to post the Ronaldinho-esque ‘man-dana’ Buffon has resorted to wearing! It looks to me like it’s not his actual hair, but that the fox that I saw in a “don’t wear fur” ad on the subway was unfortunately later killed to glue onto Alan Smith’s head.